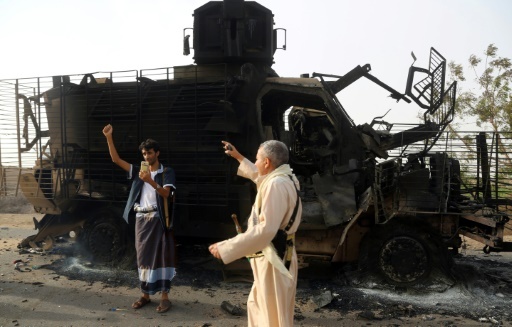 Khokha (Yemen) (AFP) – The battle for a major rebel-controlled port in Yemen has left more than 100 soldiers and insurgents dead in less than a week, medics and military sources said Saturday. Yemeni forces are fighting to close in on the Red Sea port of Hodeida, the main conduit for humanitarian supplies into a country where 22 million people are in dire need of food aid. Medics in the southern Aden governorate, where the Yemeni government is based, said they had received the bodies of 52 people, including 20 soldiers, between Friday and Saturday, bringing the toll to at least 110 killed in clashes since Wednesday. The remainder appeared to be rebels, the medics said. Speaking on condition of anonymity, a source in the pro-government military coalition said on Saturday the Huthi rebels had ambushed a military convoy in the coastal district of al-Durayhmi in Hodeida governorate. Loyalist fighters, backed by Saudi Arabia and the United Arab Emirates, last week announced they had launched an operation to enter Hodeida city and seize the rebel-held port. Hodeida lies 230 kilometres from the capital Sanaa, which the Iran-backed Huthis seized in 2014, prompting a Saudi-led military intervention in Yemen the following year. The campaign, which continues to this day, aims to restore power to the internationally recognised government of exiled President Abedrabbo Mansour Hadi. The Saudi-led coalition accuses the rebels of using Hodeida as a launchpad for attacks on shipping in the Red Sea and for smuggling in rockets. The insurgents have in recent months ramped up missile attacks against neighbouring Saudi Arabia. Nearly 10,000 people have been killed since the coalition launched its military campaign in Yemen in March 2015. More than 2,200 others have died from cholera and millions are on the verge of famine in what the United Nations says is the world’s gravest humanitarian crisis. The UN warned last week that any operation aimed at seizing Hodeida would disrupt the entry of aid shipments to Yemen, 70 percent of which flow through the rebel-held port. Featured Photo: AFP/File / ABDO HYDER. Yemenis check the wreckage of an armoured vehicle after clashes near the coastal town of Hodeida, on May 29, 2018.